When you have multiple buildings on site — or portions of a building that need to be preserved — yet you need a demolition, then you require accuracy that counts. 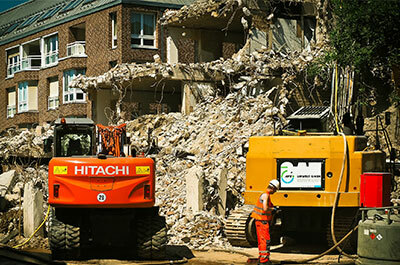 Here at JRP Services, we specialize in providing selective demolition services. Here’s why we’re the obvious choice for demolition services in Houston. To start, we’ll discuss what you’d like demoed. If you’re shelling out the interior of a structure, or part of its interior, we’ll formulate a plan to remove materials from your building safely and efficiently. Sometimes we’ll have to haul out debris wheelbarrow by wheelbarrow, other times, we’ll use a skid-steer to get the job done. We adapt to your site and your demolition needs. When it comes to the right equipment for the job, we have it all. We have all of the right tools of the trade for jobs both large and small. We can bring a front end loader and a bulldozer to larger demolitions, or, if we’re completing a selective demolition in tight quarters, we can switch to jackhammers and sledgehammers. Regardless of the job, we’ll bring the equipment necessary to get the job done safely and done right. customer service, and we treat each property and each job as if it were our own. In short, we strive to be the best demolition operation that you can find. Our demolition services don’t stop there. You can see our full list of demolition services. We also provide excavation services and site preparation, including lot clearing and grading. That makes our company an ideal choice for even the most difficult, demanding, and diverse jobs. No matter the project, we can get it all done in one fell swoop. If you’re ready to see the JRP Services difference for yourself, don’t hesitate to get a free quote right away! We provide demolition services throughout Houston, including pool removal, residential demolition, lot clearing and grading, concrete removal, site preparation, debris cleanup, excavating, bulldozer services, and of course, selective demolition.